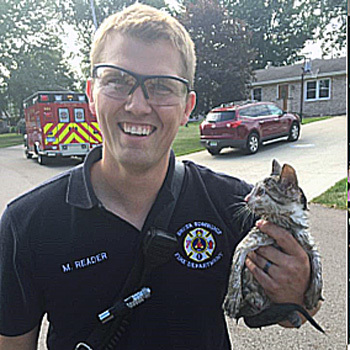 The Delta Township Fire Department rescued a kitten from a storm drain on Aug. 14. After being cared for by animal control, the kitten was adopted by a member of the dispatch team, Deputy Director Lara O'Brien. A) Poppy B) Stormy C) Hope D) Delta. 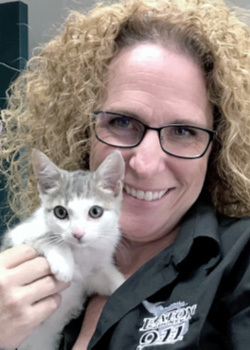 Photos: (above) Eaton County Dispatch 911 Deputy Director Lara O’Brien with her new kitten. (left) The so-far-unnamed kitten with Delta Fire Department firefighter/paramedic Reader after her rescue from a storm drain.